I’ve been interested in two page layouts with different backgrounds for awhile now. Love the challenge of making them cohesive yet with two distinct halves. This topic was a great one for this type of layout because it had two sides to the story. My oldest and youngest loved splashing in the pool while we were on vacation, but my middle son had broken his collarbone shortly after we arrived and couldn’t go in the water. So I created a simple fun page with some of my pool photos for the left side of the spread, and told the story of my middle boy being a good sport on the right. I kept the second page more subdued version of the first maintaining cohesion mainly through the colour palette. I like the tension created by the divide between the photos. One of the best things about living in a place where other people come for holidays is simply staying home. It’s a holiday weekend in BC and the campsites are full, the highways are busy and we’re staying home. Which means that I get to have the best of both worlds this weekend – play with my family at the beach or in the woods then come home to play in my scrap room. It’s also a Best of Both Worlds weekend on Shimelle’s blog with lots of scrappy inspiration and challenges to play along with. Three challenges have been posted so far with more to be posted all weekend. I’ve got ideas flowing for two of the three challenges so far, so I’m getting cracking on them tonight so I can build some scrappy momentum for the rest of the weekend. P.S. I have a couple of pages from 2 Peas’ CHA challenges to take photos of and post this weekend, too. Crazy, yes, but definitely not lazy or hazy around here this summer. I have done some scrapping in spite of the chaos around here, but haven’t managed to get photos taken, or do much journaling. I need peace and quiet to journal. Here’s what I’ve been up to. These are photos of my oldest the day he got his first pair of glasses. He LOVED them! I expected him to resist wearing them, but no, he wanted to wear them all the time. I haven’t written any journaling for this page because my husband has been away and I wanted his input since these are photos from our honeymoon. I was inspired by Case File No. 78 from the CSI challenge site. I didn’t make their deadline, but loved the inspiration. I have a couple more pages to share when I get a chance to take photos of them. While I was waiting to set up my new room, I dealt with my frustration and excitement by kicking up my (re)organizing efforts a bit (and eating too much chocolate). One of the problem areas of my stash is my stamps. There are so many great clear stamps these days and they are one of my weaknesses. 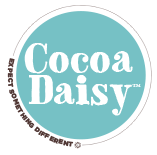 I subscribe to the Cocoa Daisy stamps, which I love, but haven’t found a way to organize them so they are easy to find and use. So I don’t use them as often as I’d like to. I had started sorting them into old CD cases by type (words, shapes, flowers, Christmas), but got stalled when it became clear there would be a LOT of CD cases to store and label and index in order to find the stamp I wanted. So that project sat unfinished for months. It was starting to look like it was going to be a lot of work to use my stamps if they were stored this way. Tracy’s video shows her adhering the plastic image sheets from her stamp sets on the cardstock. Many of my stamps don’t have image sheets, either because they were thrown away during my CD case organizing, or they are from my Cocoa Daisy kits and simply didn’t come with one. My solution was to simply stamp the cardstock before sticking the stamps on the back. A bit more time, but definitely worth it. And I had time on my hands. I like the final result. I’m a little surprised that I mostly filled a basket already. I’ve started moving furniture into my new room. Progress seems slow to me, I want to twitch my nose and have it all in place, but alas there is no magic genie here. I went down to Vancouver last weekend and spent most of an afternoon getting lost in Ikea. I emerged with two Stenstorp kitchen islands, one blue Raskog cart and a variety of boxes and such. And so assembly started shortly after I got home. I assembled the bases for the islands/workbenches myself. Then I called my multi-talented assistant to help attach the tops (and tighten screws for me). Our trusty supervisor kept a safe distance. She’s been a little anxious about all the change and strange smells. I had to assemble my cart while waiting for my assistant to be available. I makes me happy, even empty. I’ll fill it up after I have all my furniture in place. Debbie Hodge’s Design Critique Workshop last March/April helped me get back in the scrapping saddle. It felt great to be back with this group learning/reviewing design principles, applying them to my pages and getting/giving feedback on what works and what can be tweaked a bit and, of course, laughing all the while! This is my first draft of Puppy. I took the photo before I finished stitching because I needed to post before the critique group deadline. I figured we could imagine what the title would look like when the stitching was finished. I knew I’d be tweaking the page after class anyways. Here’s my final version. I love the addition of the stitched frame around the photo and the added texture and colour of the enamel dots. This page did not turn out anything like I intended. I LOVE these photos of a day last summer when we went sailing in the rain in Halifax harbour. So I ordered some of the Glitz Uncharted Waters collection and started planning how I’d use them. When I sat down to scrap, I got swept up in my memories of the day and found that didn’t use any of the papers, only some of the die cuts and a couple of journaling cards. So much for planning ahead! I added a watercolour effect under the photos by misting the cardstock with water then spraying and splattering it with a couple different mists. I dried it overnight under weights with scrap paper to absorb some of the water. It almost lies flat now. I also moved the photos a bit and rearranged the embellishments. I like the added focus on the central photo and title block. These are really old photos from my honeymoon in Spain and Portugal. I wanted to play with an informal grid structure. I’ve had an idea to use some of my 6×6 papers in a four square design for awhile now, so this seemed the time to play with it. This came together I ran out of time to add my journalling, so I simply added to strips to show my intent. A few tweaks: I added yellow stitching around my title. I added a few more ink splatters around the edges of the cardstock. I machine stitched around my papers and bent the edges up for more dimension. I also outlined the photos with black marker. And of course, I added my journalling. Hmmm, I just noticed that I left off the grid washi tape in the final version. I don’t really miss it. Sigh. I love these photos of my oldest son taking photos at the Halifax Citadel last summer. He was just starting to explore photography. Brought back great memories of learning to use an Kodak Instamatic camera when I was his age. My tweaks: I cut off the red and blue striped edges and added a dark brown ledger paper frame and added some brown ink splatters. I also cut off the colourful arrows on the journalling card. I changed my clusters to vary their size. Well. That was a rather longer break than I had intended. I actually didn’t plan on taking a break from blogging. I was sick for awhile, then busy trying to catch up on life, then I simply didn’t know how to start again. Past time to find a new blogging routine. One of the ‘life’ things I’ve been busy with is the renos to my new studio. There have been a lot of changes since I showed the ‘before’ photos in this post. There were delays getting the tile floor installed that really dragged on. Meanwhile I was thinking hard about installing a built in counter and desk. I got really stuck about it. This is the back corner of the room. I’ve painted the cedar walls a pale grey. I tried an off white, but it was far too bright. I really like the texture of the siding after it’s been toned down with paint. I plan on putting some Ikea kitchen islands along the back wall for counter space and storage underneath. I’m undecided about installing shelves above them. Not sure about horizontal lines on the diagonals and also how easy it would be to reach them across the rather deep islands. This will be a sitting area with display/storage shelves along the wall. The walls are a bit brighter than they look here. I was aiming for a faded vintage robin’s egg blue, but they’re a bit brighter than that. I really love the new door with the ribbed glass insert. I’m sure I’m forgetting something, but that’s OK. I plan on moving in slowly and take some time organizing my stash. Well, I’ve dropped the (Calvin)ball this last week, while I scrambled to empty the junk out of what will be my new craft room so the reno work can begin, and got thoroughly distracted by sorting/reorganizing my stash. I’m really loving the excitement of a room of my own. Without boys pestering me to play computer games across the room. While I’m waiting for my new craft room, I’ve been rethinking how I store my stash. Or rather, how I want to store things in my new room, because I have to admit that the floor and my work table seem to be where most of my stash has been living lately. Or at least the things that I’ve been using. All the things that are put away are being ignored and not used or loved. I tend to use the stuff that I see. But I don’t want my new room to look as chaotic and cluttered as my current space. So I grabbed my crusty old glue gun and some mason jars and went to it. I ran a line of hot glue along the side ‘seams’ on my jars and stuck them together in a few minutes (not counting interruptions by the shorter members of the family). I used a box lid to make sure the jar bottoms were lined up while I was gluing them together.